There are three very different readers: Cavan poet, Paddy Halligan, member of LitLab will be followed by Galway Poet, Rachel Coventry, who recently took part in Poetry Ireland Introductions, and Leitrim performance poet, Stephen A Murphy is the third featured reader. There will be an open mic session afterwards where budding writers and poets from Cavan and further afield will have an opportunity to read a short piece of work. This is the second event in this series. All welcome. 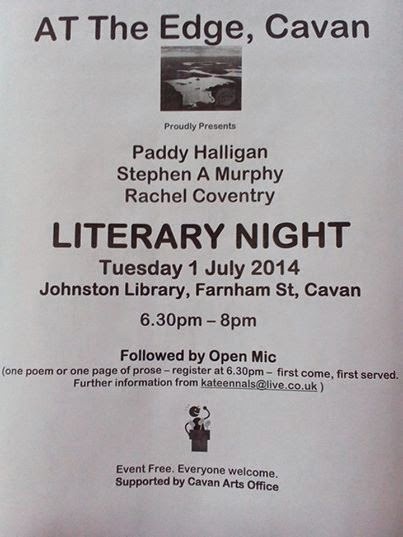 Labels: Paddy Halligan, Rachel Coventry, Stephen A Murphy; Cavan library; Kate Ennals: At the edge Cavan. The iYeats International Poetry Competition 2014 is now open for submissions. There are two categories: General (for adults) and Emerging Talent (for poets aged between 16 and 25). Deadline: Wednesday 9 July 2014. 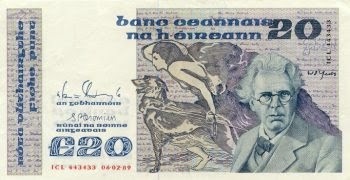 Prizes are usually presented at a reading during the Yeats Summer School which takes place this year 27 Jul - 8 Aug. The judges for 2014 are Peter Sirr and Catherine Phil McCarthy. 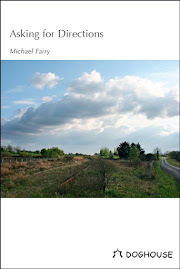 Entry fee: €5 per poem, or €12 for three poems. 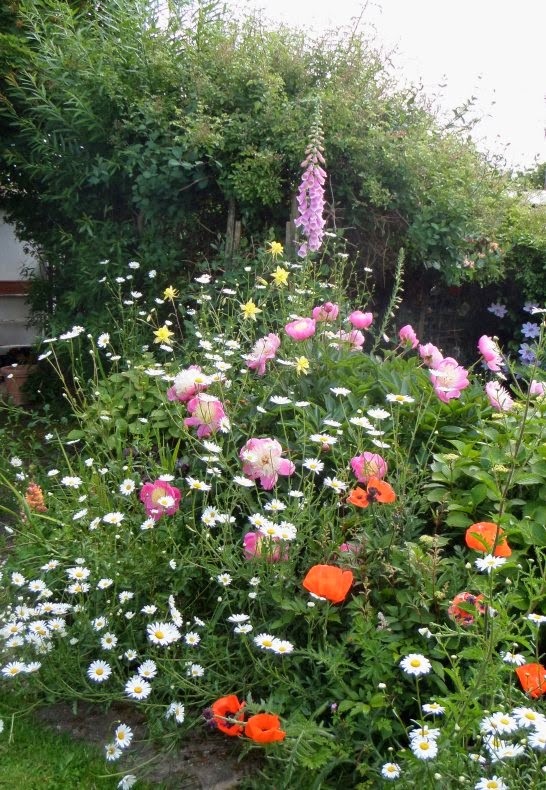 A very good year for the garden! "I love flowers Id love to have the whole place swimming in roses God of heaven theres nothing like nature the wild mountains then the sea and the waves rushing then the beautiful country with the fields of oats and wheat and all kinds of things and all the fine cattle going about that would do your heart good to see rivers and lakes and flowers all sorts of shapes and smells and colours springing up even out of the ditches primroses and violets nature it is as for them saying theres no God I wouldnt give a snap of my two fingers for all their learning . . . "
Circa Words 2014! 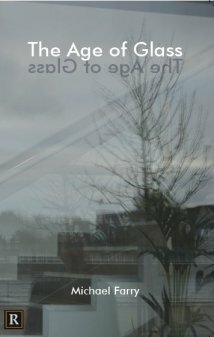 – a two-day experimental writing festival taking place over Bloomsday weekend, paying homage to James Joyce as 'godfather' of experimental fiction by providing a space for contemporary experimental fiction writers, publishers and readers to meet, experience new forms of writing and even share their work. 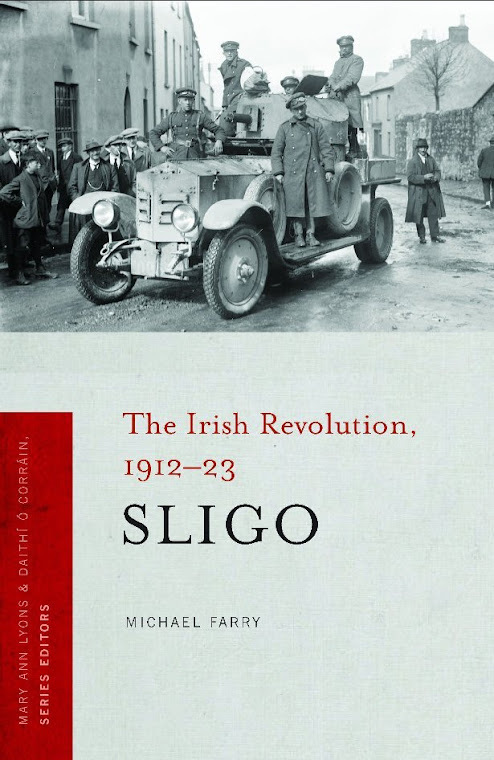 Full details on the Irish Writers Centre website. Boyne Berries Journal is delighted to be part of the Bloomingle and the Boyne Berries stand will be attended by the editor, Orla Fay, assisted by the previous editor, Michael Farry. By the way submissions for the next issues of Boyne Berries are now open, follow the link. The festival begins on Saturday morning with a marketplace where teams from progressive journals will meet and 'sell their wares' to interested writers and readers. Budding writers will equally get the chance to pitch to journals in this give and take environment. We're expecting a bustling morning with lots of networking and sharing of information. Prepare to unearth the hive of activity that is the Irish journal scene. 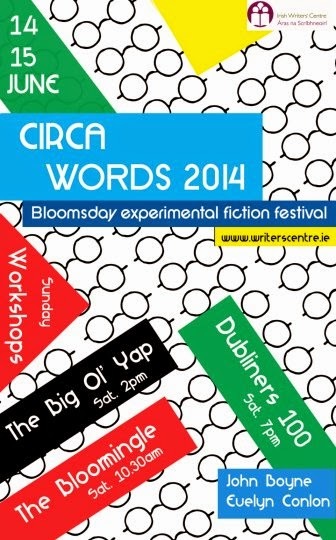 Other events for Circa Words 2014! 2–4pm: The Big Ol' Yap: Talk-shop moderated by Dave Lordan, experimental fiction writer and teacher. Expect discussions, disagreements and just a bit of chaos. Free event, suggested donations: €5. All welcome. The London Magazine has launched a worldwide poetry competition which is be open for all ages. This will be a chance to get published in one of the oldest and most prestigious literary journals in the UK which has been home to Sylvia Plath, Ted Hughes, Christopher Reid and many more, along with winning a cash prize. Entry fee: £5 per poem. Judges: Hugh Dunkerley and Michael O’Neill. Labels: London Magazine; Poetry Competition; Hugh Dunkerley; Michael O’Neill. The Battle of the Books is an international writing competition (open to poetry and prose) organised by the Swift Satire Festival in Trim, Co Meath. A prize of €500 will go to the winning entry. Closing date for entries is Tuesday 1st July, 2014. Poems: minimum 40 lines, maximum 60 lines. Prose: minimum 800 words, maximum 1,000 words. Entry fee is basically €5 per entry, though there is a bargain offer of €10 for three entries. Travel is the theme of the competition, but the interpretation of ‘travel’ will be very wide indeed. The competition is being run by the Festival, which will take place on Saturday/Sunday 12th/13th July. Shortlisted competitors will be invited to read their entries at a function in the town on the Saturday night. Writers who cannot attend will have their pieces read for them by actors or other writers. The festival celebrates the life and works of the writer Jonathan Swift, who lived at Laracor, just outside Trim, for many years. This writing competition celebrates Swift’s wonderful talent as a storyteller. ‘You prevailed on me to publish a very loose and uncorrect account of my travels’. In other words, anything goes – as long as it has some mention/whiff/suggestion of travel. It can be pure fiction or memoir or any other genre of writing. Humour is not essential but it certainly won’t do an entry any harm. Entertainment is highly desirable. Note: previous publication elsewhere does NOT disqualify. The material must, of course, be the entrant’s own work. 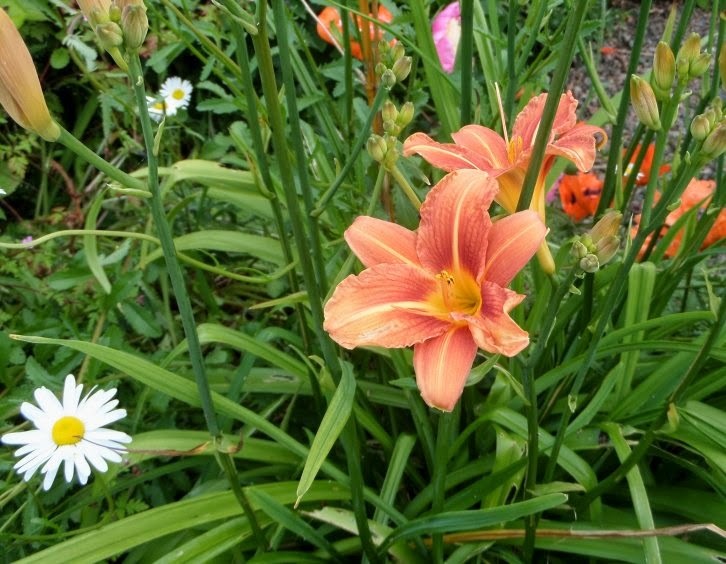 Judging will be by Niamh Boyce who has blogged about it here. Postal and online entries are welcome. Online payment by PayPal is being set up on the website. 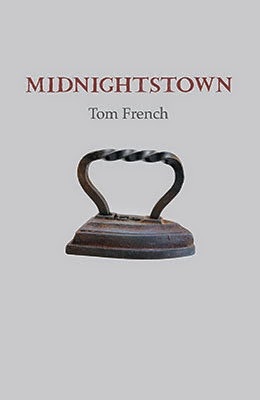 The Gallery Press in association with Meath County Council Library Service is hosting a reception to celebrate the publication of a new collection of poems by Tom French, Midnightstown, in Dunboyne Library, Castle View, Dunboyne, County Meath at 7.00 p.m. on Thursday 5 June 2014. All welcome. Tom French’s third collection opens with the poet alone with his newborn son in a delivery room. Through what North described as ‘a heartbreaking quality of understatement’, he confronts and stares down extreme experience and praises the everyday. An oncology diary is simultaneously dispassionate and moving. In language of calm power he registers a brother’s suicide and fraught relationships. He offers glimpses of a battle in World War I, while other poems observe saplings as they prosper and actors preparing a play. They record incidents in barbers’ shops and salvage materials from old newspapers. ‘our loved and unloved, living and dead . . .